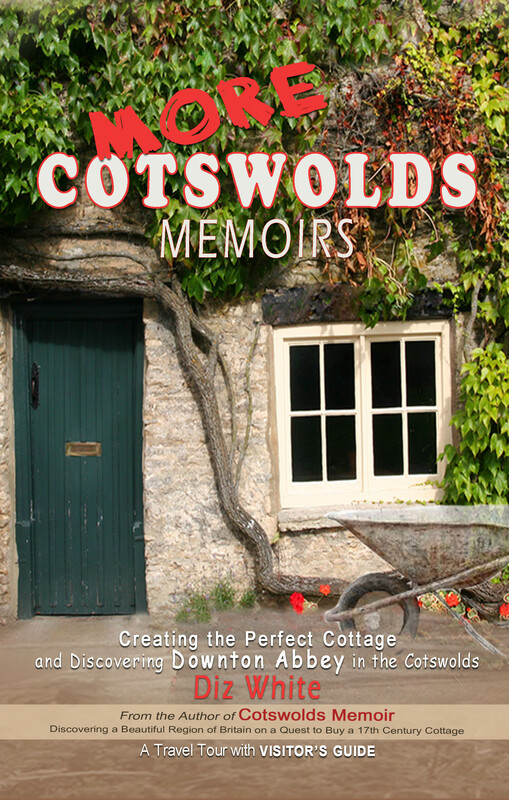 COTSWOLD MEMOIR and MORE COTSWOLDS MEMOIRS. Cotswolds Memoirs, Discovering a Beautiful Region of Britain on a Quest to Buy a 17th Century Cottage. (Ranked #1 Best Selling in British Travel in Kindle on Amazon), a love note to this beautiful area, is the first book in a series. The story begins when this British-born author and comedy actress’s roots pull her back from the glitz and glamour of a Hollywood career to the UK with her American husband, where a cure for her homesickness leads to a fun-filled, roller-coaster ride. The many pitfalls that come her way during her journey are seen through the prism of comedy and turn this tale into a laugh-out-loud, good life, foodie, meet the eccentric locals, cliff-hanging read. In the second book of the series which can be read independently of the first, More Cotswolds Memoirs: Creating the Perfect Cottage and Discovering Downton Abbey in the Cotswolds, Diz’s journey continues during her bid to turn her newly-purchased home into the perfect cottage. Her many adventures include coming across the film locations of Downton Abbey, delving into their history and meeting with the cast of this world-renown series. Also, in More Cotswolds Memoirs, the author builds on to her 17th century cottage and contends with the myriad ups and downs of renovating a listed building. A collapsing piggery and other disasters turn the project into a money pit that compels her to scramble between Hollywood and the Cotswolds, often hilariously descending the ladder of success as she takes every acting job offered in order to finance her dream. The author’s search for vintage building supplies leads to an exploration of the Cotswolds with its pub walks, hog roasts, Roman settlements, and eventually, the Downton Abbey film set in Bampton where she attends a wrap party with the cast. Diz becomes fascinated with the history of the sites used in the filming, identifies all the film locations in the Cotswolds and traces their origins. In order to overcome all obstacles her journey develops into a race against time, to achieve her goal, Cotswold bliss in her newly-renovated cottage. British-born Diz White divides her time between Hollywood and the Cotswolds. Acting credits include Star Trek: The Next Generation and Bullshot (HandMade Films), Titanic (VO). Other books by this author: Haunted Cotswolds and Haunted Cheltenham (The History Press). In the new book, More Cotswolds Memoirs: Creating the Perfect Cottage and Discovering Downton Abbey in the Cotswolds, author and comedy actress Diz White explores this lovely area during a bid to turn her newly-purchased home into the perfect cottage. Her many adventures include coming across the film locations of Downton Abbey, delving into their history and meeting with the cast of this world-renown series. More Cotswolds Memoirs, a love note to this beautiful area, can be read independently, however the story begins when this British-born author’s roots pull her back from the glitz and glamour of a Hollywood career to the UK, with her American husband, where a cure for her homesickness leads to a fun-filled, roller-coaster ride recounted in the first book of this series, Cotswolds Memoir: Discovering a Beautiful Region of Britain on a Quest to Buy a 17th Century Cottage. (Ranked #1 Best Selling in British Travel in Kindle on Amazon). In More Cotswolds Memoirs the author builds on to her 17th century cottage and contends with the myriad ups and downs of renovating a listed building. A collapsing piggery and other disasters turn the project into a money pit that compels her to scramble between Hollywood and the Cotswolds, often hilariously descending the ladder of success as she takes every acting job offered in order to finance her dream. The many pitfalls that come her way during her journey are seen through the prism of comedy and turn this tale into a laugh-out-loud, good life, foodie, meet the eccentric locals, cliff-hanging read. In order to overcome all obstacles her journey develops into a race against time, to achieve her goal, Cotswold bliss in her newly-renovated cottage. Crumbs magazine interviewed me about my kitchen, in the camera-ready Cotswolds my book Cotswolds Memoir and its sequel which I am currently writing. Enlarged text of article (below). I’m pleased to share my recipe for Lavender lemonade. Of course, fresh picked lavender is best for aroma and flavour. (Ingredients listed below are best sourced in the Cotswolds if possible). 2 – 3 cups full of fresh lavender blossoms or more if easily available – grown in the Cotswolds. Remove most of the stalks. 1 jar (or to taste) Cotswolds Honey – must be from honey sold in a glass jar. 3 cups of de-ionized or distilled water. 4 lemons (organic and from the Cotswolds if possible). 5 Cups of cold water – (or more or less to taste). All kitchen items used to prepare this lemonade must be made of glass or stainless steel and the spatula must be wooden. The method of squeezing the lemons must be done using glass or stainless steel. The strainer used for the lemons and for the lavender must be plastic or stainless steel (Most strainers are not made of stainless steel). This is what will give the lavender colour to the lemonade. Use either a stainless steel saucepan or an ovenproof glass dish to heat the distilled water or de-ionized water. If distilled or de-ionized water is used it is possible to store any leftover infusion in the fridge for up to two weeks and use it for more lavender lemonade. If tap water is used this ruins the infusion if it is to be stored in the fridge. Tap water may be used if all of the infusion is used immediately. Heat distilled water and just before it boils remove it from the stove top. Save 2 or 3 Table Spoons of the heated water and set aside. Place the lavender blossoms in the heated water. Prod and stir with wooden spoon occasionally as lavender steeps for five minutes or so. Pour the 2 or 3 Table spoons of de-ionized water that was set aside onto the Cotswolds honey. Stir to soften enough for it to be poured. Strain the lavender infused water through a plastic sieve into a glass container. Pour into glass bowl to check for any remaining plant material. If found strain again or remove. Squeeze the lemons and strain (through plastic strainer) Set aside. Put the lemon juice into a large pretty glass or ceramic jug. Add cold water in stages. Add honey in stages until desired sweetness. Add lavender infusion to the lemonade until whole jug of lemonade turns a lavender hue. Store any remaining infusion in a glass jar in the fridge (for up to two weeks) for more lemonade. Add ice cubes and garnish with slices of lemon, lemon wedges, paper parasols or other decorations. 6 Lavender infused ice cubes (optional). (See Recipe for Lavender Infusion in Lavender Lemonade Recipe above). 3 or 4 Sprigs of fresh lavender (optional). Add Gin, Lavender Syrup and plain ice cubes to a cocktail shaker. Add lavender infused ice cubes. Fill cocktail glass with Elderflower cordial. Send me a copy of your Cotswolds LAVENDER LEMONADE AND/OR GIN FIZZ PHOTO with your own decorations. Competition is ongoing – prizes given periodically. A portion of the proceeds of every copy of this author’s book COTSWOLDS MEMOIR: Discovering a Beautiful Region of Britain on a Quest to Buy a 17th Century Cottage is donated to Cotswold conservation institutions. Traditional country crafts keep the Cotswolds beautiful. Discovering a Beautiful Region of Britain on a Quest to Buy a 17th Century Cottage. During the hike, we came across a farmer repairing a dry stone wall. These walls are characteristic of the Cotswold region and add enormously to the beauty of the landscape. Made from the local honey-coloured stone without any kind of mortar, they are assembled like giant jigsaw puzzles. We watched, fascinated, as the farmer took pieces of jagged, uneven stone and fitted them together perfectly as he talked. I asked how he did it so expertly. ‘Mainly by feel,’ he answered in his broad country accent. He was a great old character and he gave a terrific impromptu talk on dry stone walling. The charming village of Bampton in the Cotswolds is used as a background to a number of outdoor scenes in the immensely successful television series Downton Abbey and this lovely spot is well worth a visit. Not only is it interesting to see where scenes of Downton Abbey are shot but there are many other attractions in Bampton that would make a leisurely sojourn there very memorable. Bampton, or as it was once known Bampton-in-the-Bush, is situated in the county of Oxfordshire in the Thames Valley and is about four and a half miles southwest of Witney. Visitors strolling around Bampton will recognize a number of buildings and streets that were used in scenes in Downton Abbey. One of the locations frequently filmed in the series is Bampton’s church, St Mary of the Virgin which dates from the 12th Century. This church, like many ancient buildings in Britain was built on the foundations of an earlier structure and incorporates parts of the older building in the new edifice. In this case, St. Mary’s church was erected on the site of an Anglo-Saxon Minster. The tower was the only feature of the Minster that was spared and it is now part of the Church. St. Mary’s is also distinguished by its magnificent 13th Century spire. William the Conqueror gave this church to the Bishop of Exeter and it has been rebuilt and added to many times through the centuries. Another location used in filming is Bampton Library which was used as the entrance to the cottage hospital that was portrayed in the second series of Downton Abbey. According to Pevsner and Sherwood’s book The Buildings of England this library was once the Grammar school of St. Mary’s church and was built in 1653. The Old Rectory which is close by St. Mary’s Church is used for the exterior shots of Isobel Crawley’s house in Downton Abbey. The south side of this building is late 17th Century and features five bays. The back of the house is older with a 16th century arched stone doorway and in the garden wall there is a stone inscribed with the date 1546. Next to the Rectory are 17th Century stables with a gabled dovecote built over them. The interior scenes of Isobel Crawley’s house, however, are filmed at Hall Place near Beaconsfield in Buckinghamshire. The series is set in the fictional Downton Abbey, a Yorkshire country house, the grand home of the Earl and Countess of Grantham, and follows the lives and fortunes of the aristocratic Crawley family and their servants through the reign of King George V.
Gareth Neame of Carnival Films originally conceived the idea of an Edwardian-era TV drama set in a country house and suggested this concept to Julian Fellowes, who had won an Academy Award for Best Writing in the category of Original Screenplay for Gosford Park. Shortly, thereafter, Julian Fellowes gave Gareth Neame an outline of the first series. Julian Fellowes writes the series, and his wife Emma acts as his story editor. In addition to Bampton being used for locations of Downton Abbey this beautiful town features plenty of Cotswolds character and is well known for several quaint traditions that take place every year and have been doing so for the past several centuries. Visitors would do well to time a visit to take in one or more of these fun-filled events after viewing the Downton locations. Once a year, on the Saturday of the Spring Bank Holiday there is a bizarre pub crawl organized by the Society for the Preservation of Ancient Junketing known as The Bampton Shirt Race. In past times the runners in this race were dressed in night-gowns and would compete in pairs with one runner pushing the other in a trolley. There was a time when there were fourteen pubs in Bampton and the race stops at every location for the competitors to down a large quaff of beer. Many of those public houses have now been converted to private residences but a stop at these former pubs is still included in the race. Nowadays, the race consists of larger teams using many different kinds of cobbled-together wheeled vehicles, such as prams, wheelbarrows and even wheelybins. These are used to transport the competitors who are costumed in outlandish fancy dress. There are prizes for the best outfits. Bampton is well known for its Morris dancing which has been practiced in the village since the late eighteenth century. The town supports three world-renowned Morris Dance teams and the dancing is performed throughout the Monday of the Spring Bank Holiday in the latter part of May, beginning at 8.30 a.m. In the evening, visiting teams join in the dancing. Much is made of the traditional fertility cake which everyone samples as it is carried around the streets with the dancers. The charming tradition of May Garland making by the children of Bampton began several centuries ago. It takes place at 11a.m. in the market square on the Monday of the Spring Bank Holiday. A Donkey Derby is run on the Monday of the August Bank Holiday, and organized by the Society for the Preservation of Ancient Junketing. This begins at 2 p.m. at Sandford’s Field. In addition to the donkey races (all the jockeys are children) there are bric-a-brac stalls, skittles, Aunt Sally, crockery smashing and much more. The Mummers perform plays on Christmas Eve every year. These plays have been performed since the nineteenth century in Bampton but are most likely much older. These dramas have been handed down through family tradition by word of mouth as no scripts exist. In the Bampton version there are ten characters including Robin Hood, Father Christmas, a Prussian King, St. George etc. The plays are uniquely performed in two acts instead of the customary one. Pagan rituals may have figured in the original plays as the plot involves many scenes of characters being finished off and then magically being brought back to life. This could perhaps symbolize the end of the old year and the beginning of the new. Watching the Mummers perform is a wonderful highlight of the Christmas season. After all this fun a little refreshment might be in order. Although this recommendation for accommodation is a fair drive from Bampton the visitor who stays here would enjoy a wonderful tour of the Cotswolds on the way to this excellent hotel and spa. This beautifully appointed hotel with the most wonderful gardens is this author’s pick for the best luxury stay in the entire Cotswolds with its relaxing spa treatments, sublime cuisine and exceptionally attentive and friendly service. One early morning in the beautiful Cotswolds I made a cup of tea and took it into the conservatory where I was amazed to see a thick mist enveloping the field view. Instead of the usual couple of hundred yards of fields, trees and hedges I could see for only a few yards beyond the dry stone wall. As I sipped my hot tea the mist began to slowly swirl, making fantastic shapes as it curled around the edges of trees and gradually lifted a little off the ground. After a few more minutes a low moo heralded a cow, wreathed in mist, as it emerged in the field like a sepia painting in soft focus. Cotswold cows are among my favourite creatures and this one was enhanced even more by the soft focus treatment of this gently dissolving background. As more cows joined the first one Randy my husband grabbed his camera and was able to capture their images before the mist was dissolved by the warm sun. Eventually the day evolved into a glorious scorcher – perfect for a picnic on the river. But I’ll never forget those magical, early morning moments when my lovely Cotswold cows appeared to be part of a Turner painting. Amazon.com rates Cotswolds Memoir as the number 1 best selling British travel book!